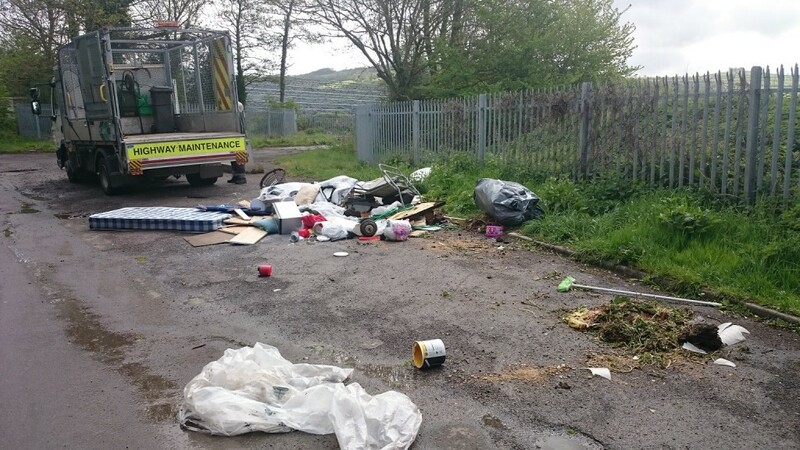 Two men, one from Oldland Common in South Gloucestershire and the other from St George in Bristol, have been given a three month home detention curfew and ordered to pay a combined total of £1,120 after admitting fly tipping waste in Upton Cheyney, South Gloucestershire. Nicky Burgess, 28, of Neads Drive, Oldland Common, and Ian Hannon, 49, of Clouds Hill Road, St George, Bristol, appeared before North Avon Magistrates’ Court on Friday 29 January. Both men pleaded guilty to jointly fly tipping waste that was found at Brewery Hill in Upton Cheyney at the beginning of May 2015. They were each ordered to pay a £60 victim surcharge and £500 each in costs. In addition, the pair were sentence to a home detention curfew between the hours of 7pm and 7am, which will apply every night for a period of three months. Both offenders will be electronically tagged to enforce the curfew. This case is the first time that this type of sentence has been given out for fly tipping in South Gloucestershire. The court heard that a property was being refurbished in Coriander Drive in Bradley Stoke and Burgess was offered payment to remove some waste. He arrived at the property and loaded the waste into his van, then together with Hannon drove to Brewery Hill in Upton Cheyney and dumped the waste. South Gloucestershire Council’s Communities Committee Chair Cllr Heather Goddard said: “Fly tipping is a criminal activity and this latest prosecution continues our zero tolerance policy. If you fly tip rubbish in South Gloucestershire, you should expect to be caught and prosecuted. “This is the first case in South Gloucestershire where offenders have been electronically tagged, which clearly demonstrates that all means of punishment will be considered by the court. • Ask for a copy of the company’s waste carrier registration certificate and ask where the waste is being taken. Legitimate firms will be happy to provide this information. Do not be tempted to use people offering cheap waste clearance on sites such as Facebook and Gumtree unless you have confirmed that they are registered with the Environment Agency. • Check whether the waste carrier is registered by calling the Environment Agency on 08708 506506 or by checking on their website.